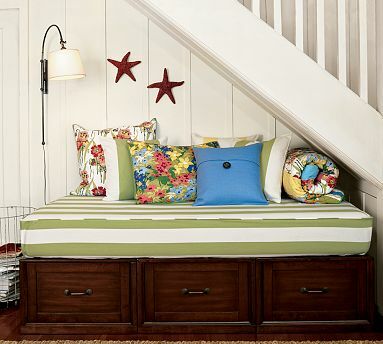 Ready to refresh your room but aren’t sure where to begin? I always love to start with fabrics from bedding, curtains, or upholstery as inspiration. The fabric is a ready made palette for choosing wall color and accent pieces. Pottery Barn has a new tool that makes the selection process even easier when it comes to bedroom fabrics and paint. Think Garanimals for home decorating. . . The Design Your Own Bed on-line tool allows you to coordinate bedding from sheets and duvets to quilts and shams. In addition, the program will suggest matching paint colors from Benjamin Moore. Now there’s no excuse to lose sleep over choosing the “right” paint color!